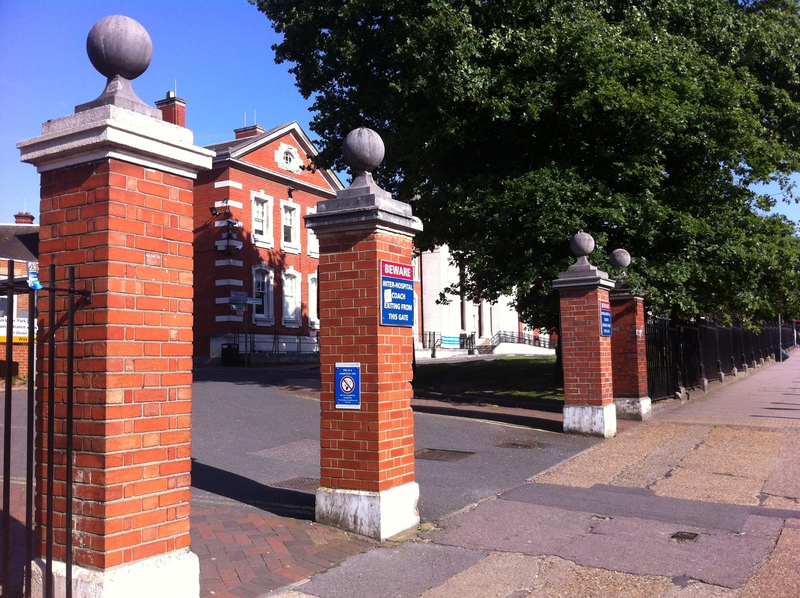 Unlike all other psychiatric hospitals before it in England, the intentions of the founders of the Maudsley hospital had intended it substantially different. 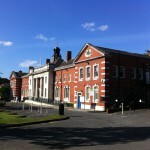 The origins and aspirations of the Maudsley hospital lie predominantly with its principal benefactor, Sir Henry Maudsley and of Sir Frederick Mott who was largely charged with bringing this idea to fruition. Sir Henry Maudsley had been a psychiatrist whose brief career in the asylum world included terms as superintendent at the Essex County Asylum, Brentwood and later the Manchester Royal Asylum at Cheadle. 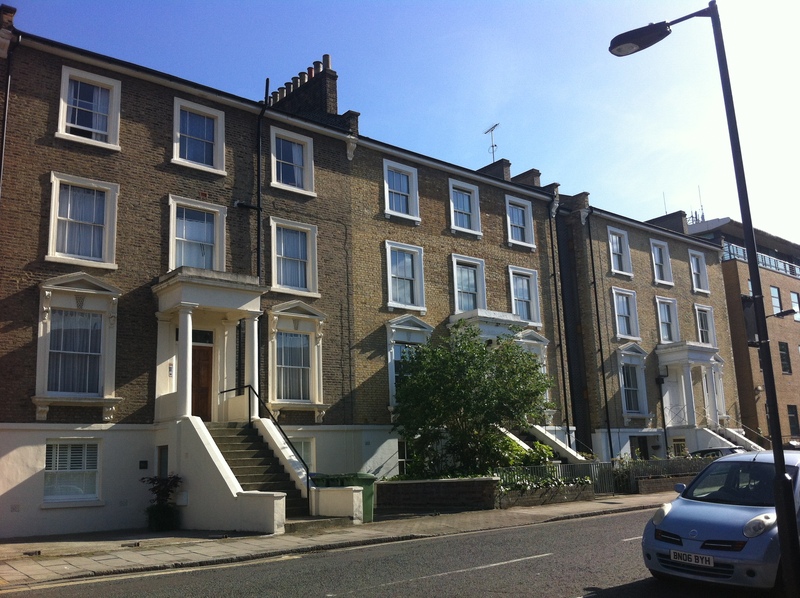 His main period of success occurred subsequently, with a prosperous career in private practice in London. His initially anonymous offer of £30,000 was made in December 1907 and was later augmented by an additional £10,000. Sir Frederick Mott by contrast had led pioneering developments in the fields of biochemistry and endocrinology and had been appointed as Director of the Pathological Laboratory at the London County Council’s Claybury Hospital. 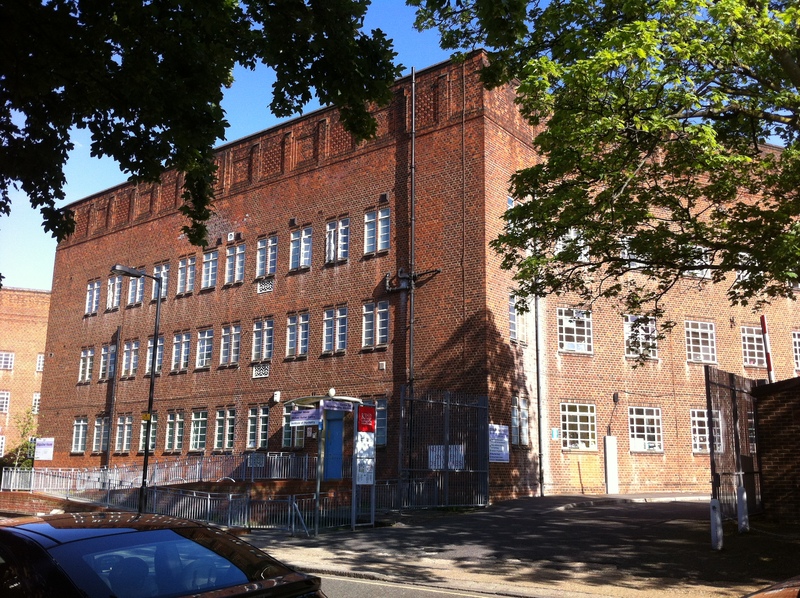 Maudsley and Mott planned an institution quite different from the asylums that had been constructed by the LCC around London at that time, particularly those at Epsom where 2,000 bedded complexes had become standard. They envisaged a hospital based on three principles, firstly that the patients should be admitted as early as possible in the acute stage of their illness to ensure best chances of recovery and discharge, secondly that the institution should provide a basis for scientific research and development (including the relocation of the pathological laboratory to the hospital), and lastly it should provide a resource for education and training. 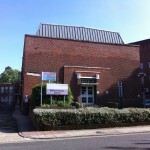 The proposals were presented to the London County Council and accepted on the basis that the site should be within easy reach of Central London, within four miles of Charing Cross to enable ease of access for patients and staff and to meet stipulations regarding potential affiliation to a Training Institute not yet possible due to the location of the LCC’s remote institutions. 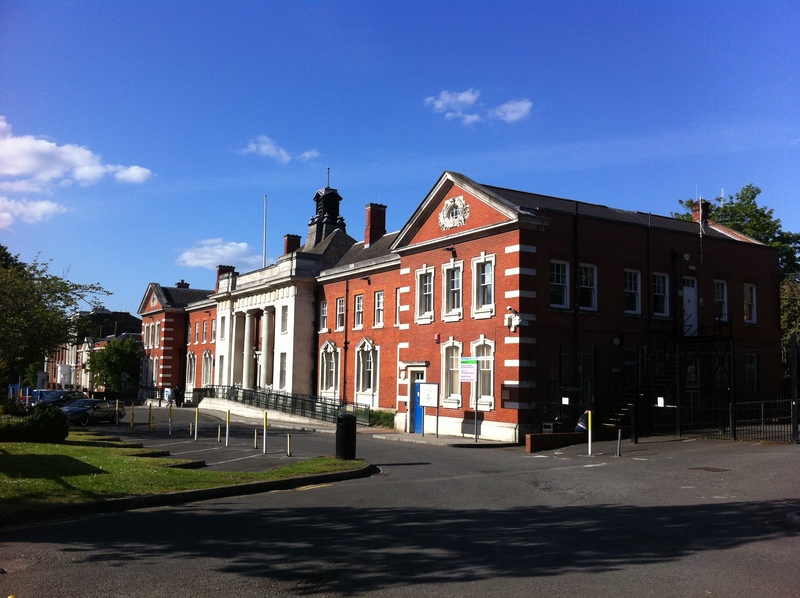 The LCC agreed to match Maudsley’s £30,000 donation. 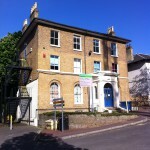 A suitable site as located in 1911 at Camberwell, on the opposite side of Denmark Hill from Kings College Hospital. 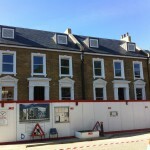 The site was bounded by numerous residential properties fronting onto the east side of Denmark Hill, De Crespigny Park (south side), Grove Lane (west side) and Windsor Road (later Windsor Walk, north side), the last of which ran parallel to the London Brighton and South Coast Railway Line and Denmark Hill Station.The area was already urbanised and the site chosen comprised of a number of Victorian Villas, mostly detached, the largest of which, no. 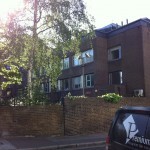 107 Denmark Hill needed to be demolished for the construction of the new hospital. The neighbouring residential properties which survived would later be purchased to form staff residences, offices or clinical buildings for the hospital. Plans were developed for the side during 1912 by William Charles Clifford-Smith, the architect to the LCC’s asylums service. Whereas George Hine had previously been responsible for most of the more routine asylum commissions at Horton, Long Grove, Bexley and Claybury hospitals for the LCC, Clifford-Smith had been responsible for a number of non-standard projects. These included the ‘temporary’ asylum complex at Horton Manor, the Ewell Epileptic Colony, various estate buildings at the Epsom Cluster such as the Central Pumping Station (later Sherwood), and villa additions to Hanwell, Colney Hatch and Banstead asylums. 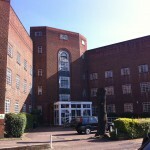 West Park Hospital was his final major work for the LCC and also his most extensive. 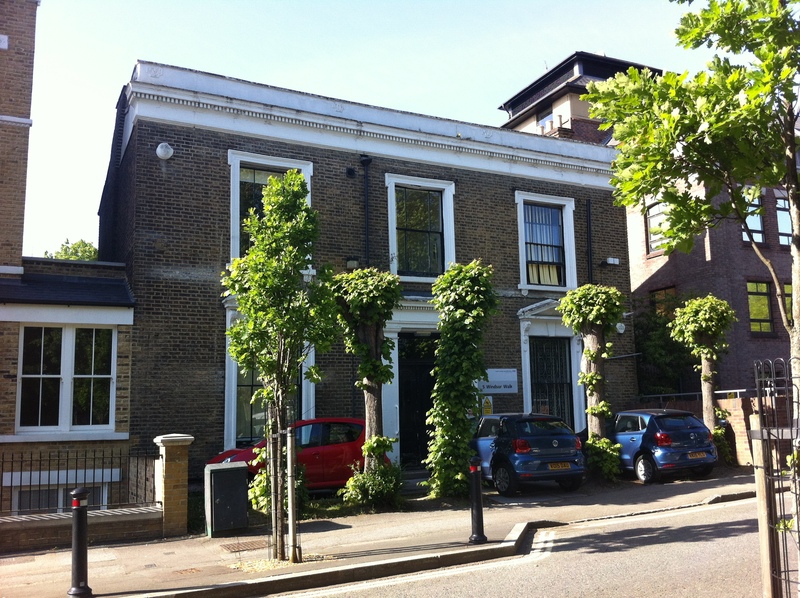 The main building, fronting the east side of Denmark Hill followed the building line of the existing houses on either side, set back from the main road and approached by steps to a colonnaded, recessed entrance area topped by a flat parapet inscribed with ‘The Maudsley Hospital’ . 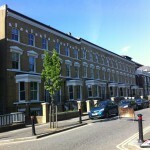 The building materials were of red brick with stone dressings and surrounds. 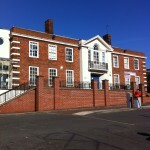 This sizeable block was originally occupied by administration, the pathological laboratory (to be moved from Claybury), outpatients department (accessed from a side entrance), a pharmacy, and doctors rooms. East of this this block stood, facing south and linked by a corridor at the north from administration stood two 3-storey ward blocks initially segregating patients on the basis of gender although this practice was quickly modified and patients of different gender were segregated subsequently by floor. The lowest pair of wards gave direct access to gardens and bore verandahs. Contemporary maps (O.S. 1916) indicate that these ward blocks were constructed and ready before the main building was constructed. 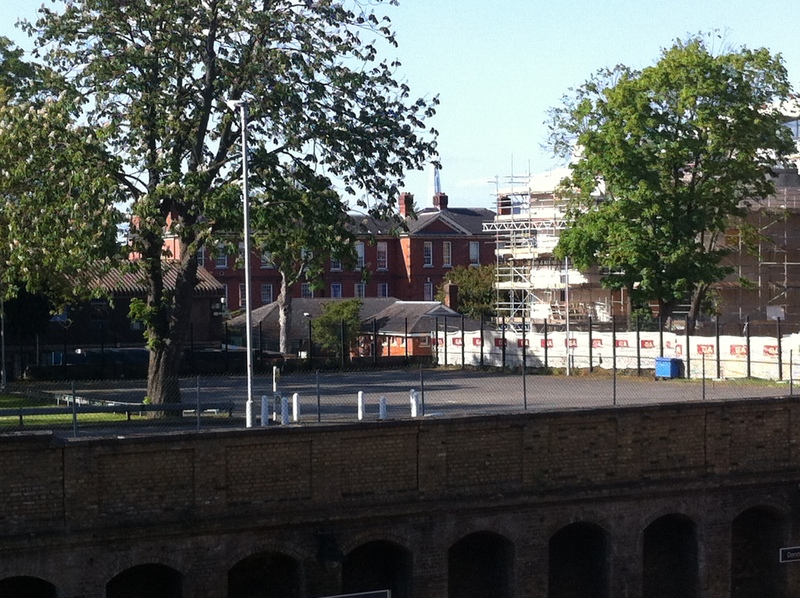 This initial complex of buildings, albeit only partially completed were requisitioned for use in the Great War and formed ‘The Maudsley Neurological Clearing Hospital’ used for military psychiatric assessment and treatment. Such patients could either be discharged as cured, transferred to other London units such as the one at the Wandsworth and Napsbury Asylums or to a special block at the Royal Victoria Hospital, Netley. 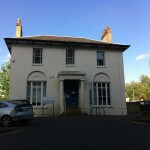 Peacetime brought closure of the Neurological hospital and eventually about a resumption of construction efforts in a bid to prepare the hospital for return to the London County Councils mental hospitals service. However it was not until February 1923 that the hospital was finally returned to use, with Dr Edward Mapother appointed as Superintendent. Mapother had previously been Superintendent during the military phase of use at the Maudsley and had returned to his previous commission at Long Grove Hospital until the hospital reopened and would remain there until his retirement in 1939. Dr Maudsley himself never saw his creation open for its intended use having died in 1918 at the age of 82. 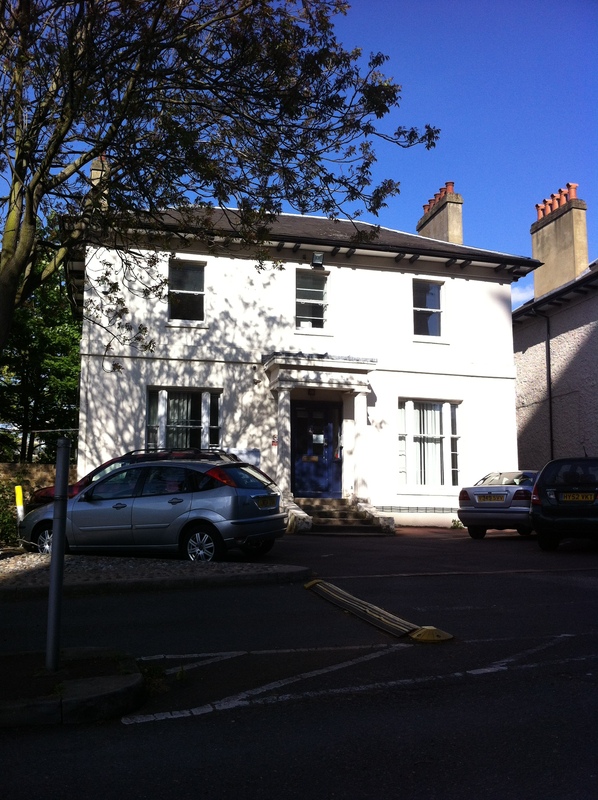 Dr Frederick Mott and his pathological laboratory had already transferred from Claybury in 1916 and from this time on the pathological service for the LCC mental hospitals had been based at the Maudsley site. Garden Villa was opened in 1931 as a special unit for patient’s considered too disruptive for the main wards enabling them to be left unlocked. The villa stood toward the east of the main complex and adjacent to a nursery garden. 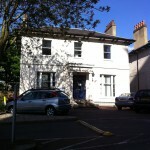 The building now forms part of the Felix Post Unit for older persons psychiatry. 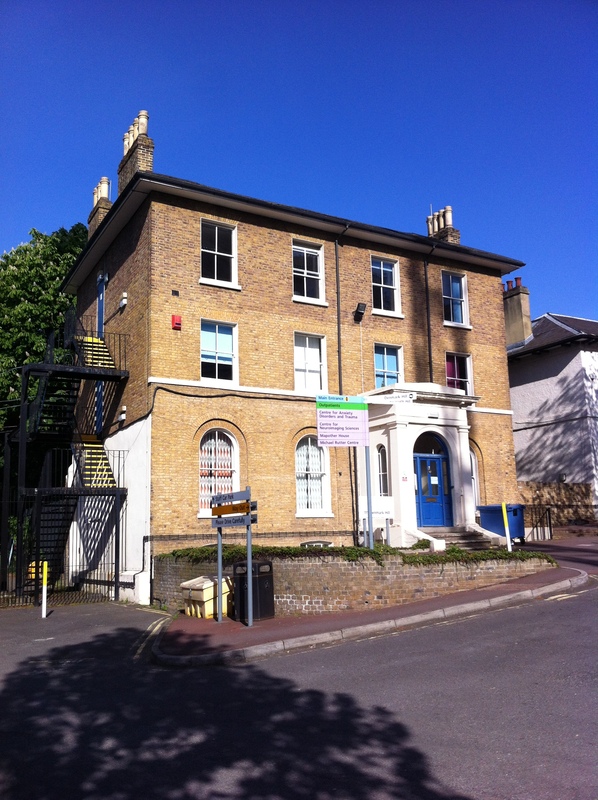 A new outpatients department opened in 1933 in a separate building, replacing a house at 105 Denmark Hill and forming one of the earliest of it’s kind at a London psychiatric hospital. This made space available in the main block for alternative uses whilst providing more space for outpatient facilities. 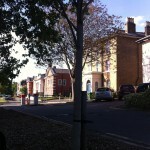 The new building was designed to complement the neighbouring main hospital building. 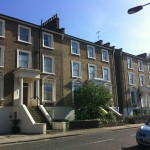 New developments continued into the late 1930’s with the demolition of houses (no. 2-12) on the south side of De Crespigny Park for the construction of two major new structures. Nearest to the main complex a four-storey wing in a modified W- formation constructed for the purpose of accommodating fee-paying private patients. 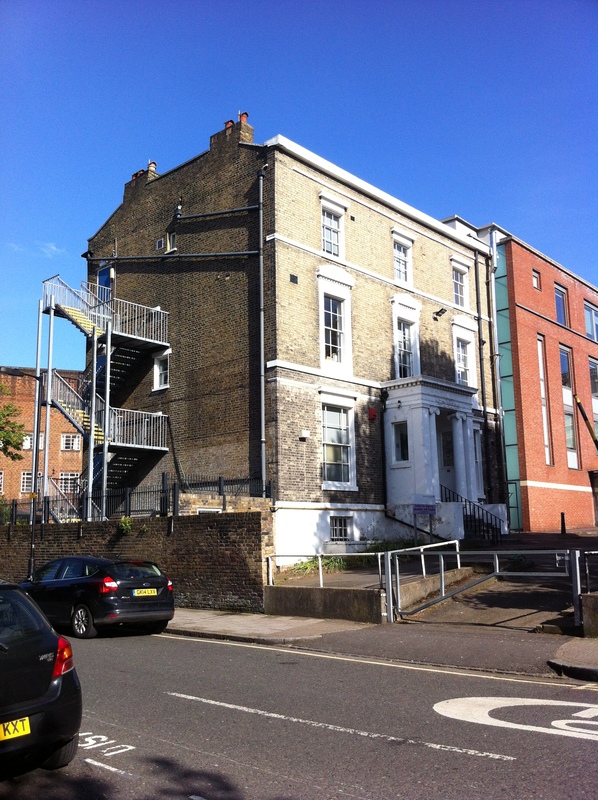 Included on the second floor was a secure balcony for the enjoyment of the patients whilst reducing risk of suicide. The main entrance and well fenestrated stair well above faced onto De Crespigny Park rather than the hospital grounds avoiding the associations of security and restriction. 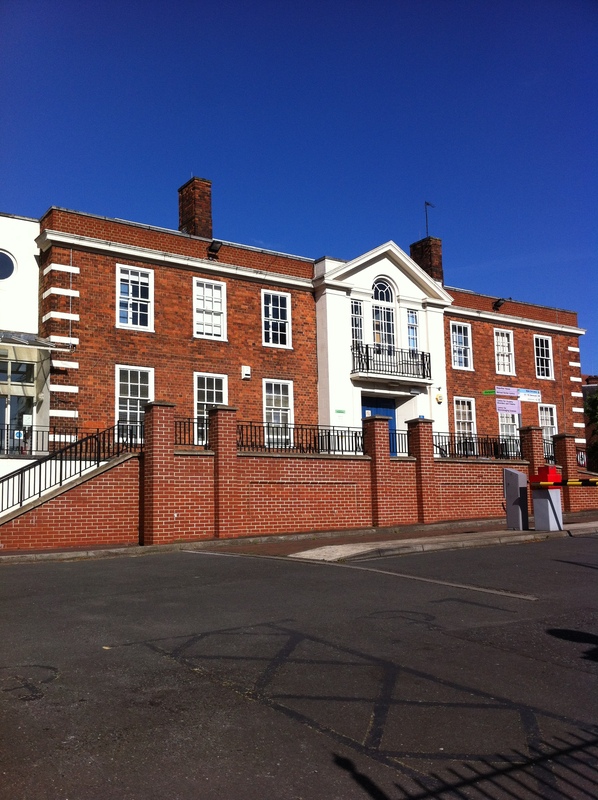 Next door stood the two storey Children’s unit designed to incorporate both wards and outpatient functions within one dedicated structure which also included a schoolroom and play facilities. 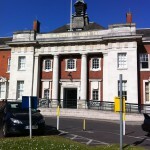 Initially however only the outpatients function was available until the whole building could be unitised until after World War II, opening fully in 1947. 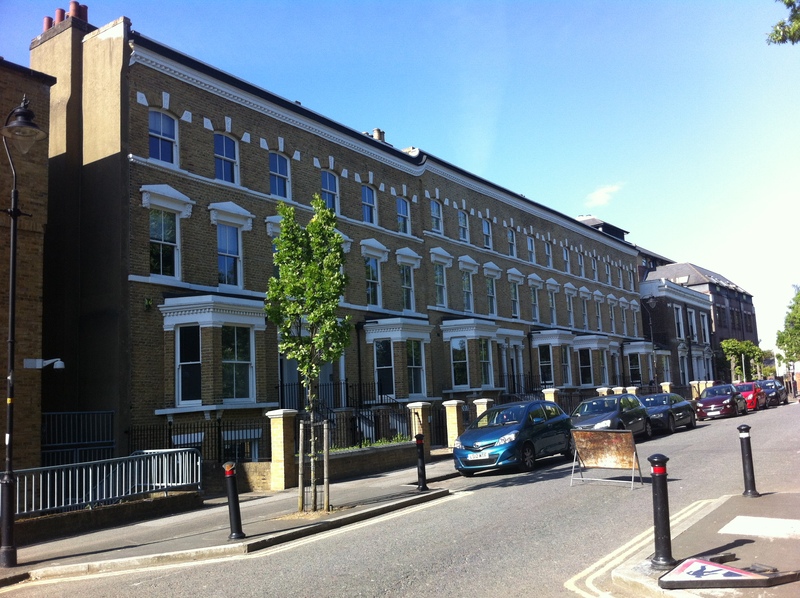 The Children’s block, like it’s neighbour was accessed from the adjacent road as well as being linked to the hospital’s main corridor. on plan the structure took on an inverted Y formation with the schoolroom at the apex between the wings. Both new structures were designed with flat roofing and parapets, in order for roof gardens to be constructed for the benefit of the occupants of the buildings as surrounding open space for recreation was severely limited. 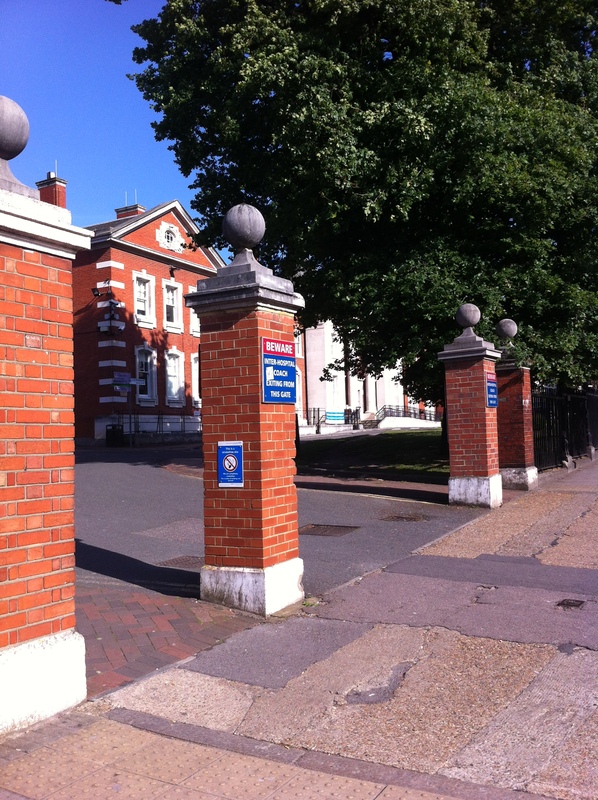 World War II meant the evacuation of the hospital and the staff and patients were evacuated from Camberwell entirely. Services continued both north and south of London in somewhat restricted circumstances at the Mill Hill Emergency Hospital in the Mill Hill School on The Ridgeway which had been evacuated to Cumberland, and at Belmont Hospital in Sutton, formerly the South Metropolitan District Schools, which subsequently became a hospital in it’s own right. 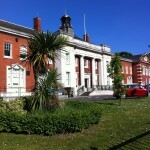 The Maudsley Hospital returned to its peacetime location in 1945 which survived the war largely intact. 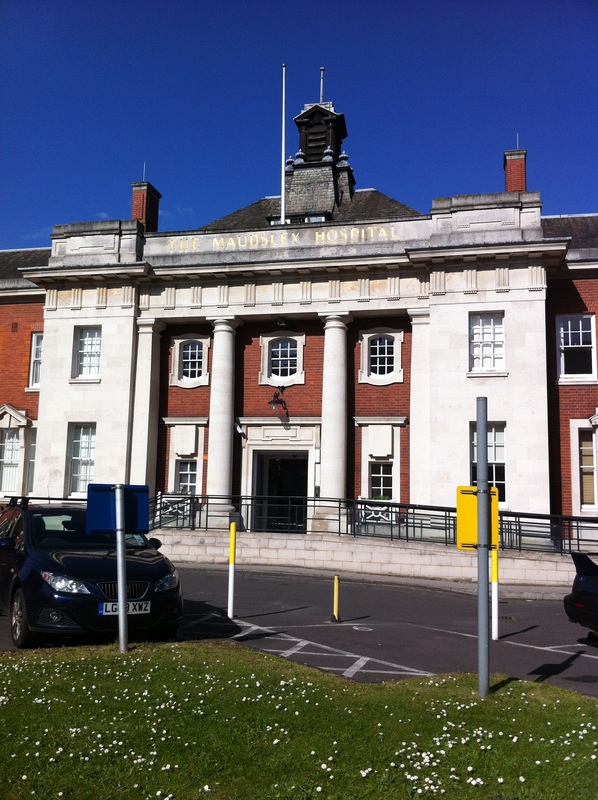 The creation of the National Health Service brought about many changes to the hospitals internal and external management, with the LCC giving up control of their flagship mental hospital along with all their other healthcare institutions. 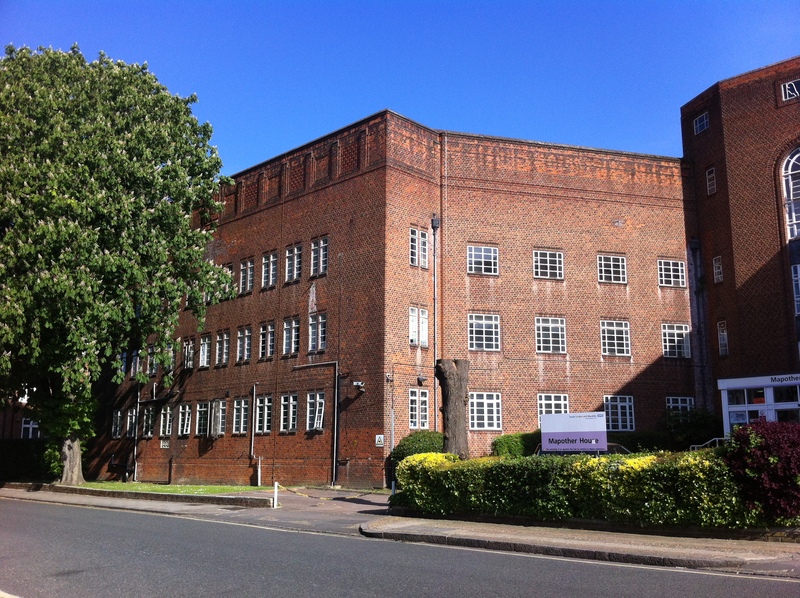 Further links were made with Kings College Hospital opposite which had also become part of the nascent NHS and the Maudsley Hospital Medical School became the Institute of Psychiatry with Dr. Aubrey Lewis, Clinical Director since 1936, as its chair. 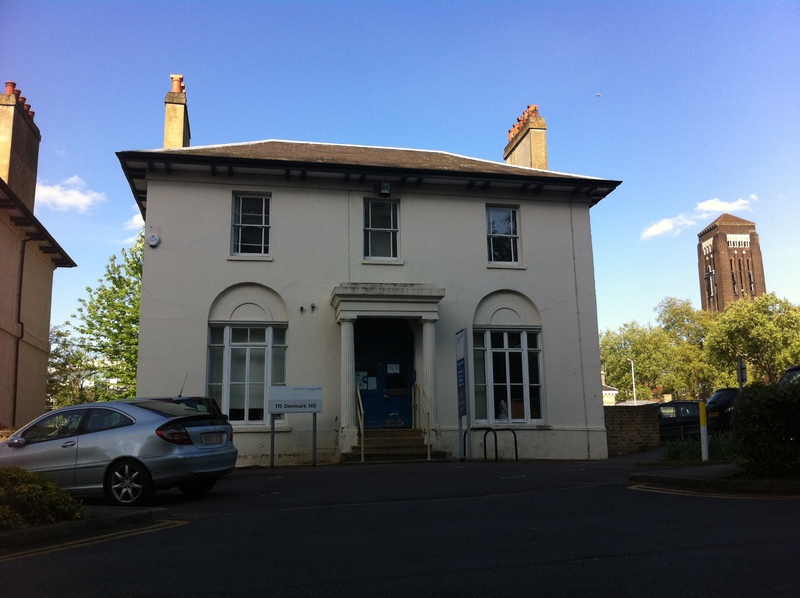 From this time much of the IoP’s development was to take place on the Maudsley site as well at Kings College to a lesser degree, but although closely linked, exists as a distinct entity under Kings College since 1999. The main building of the IoP and its grounds were constructed on the site of nursery gardens and the sites of nos.14-28 De Crespigny Park. 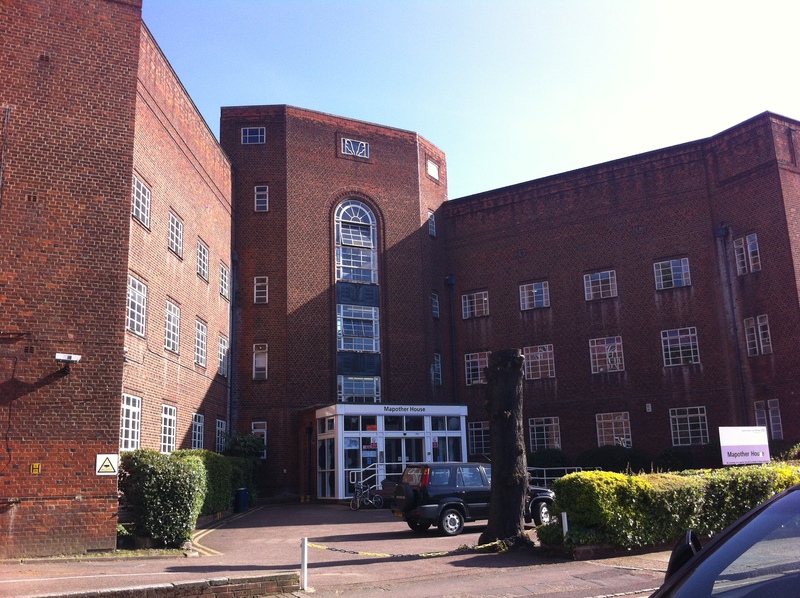 The Maudsley and Bethlem Royal Hospitals were affiliated from 1948 and were to operate as a special NHS psychiatric unit across both sites. 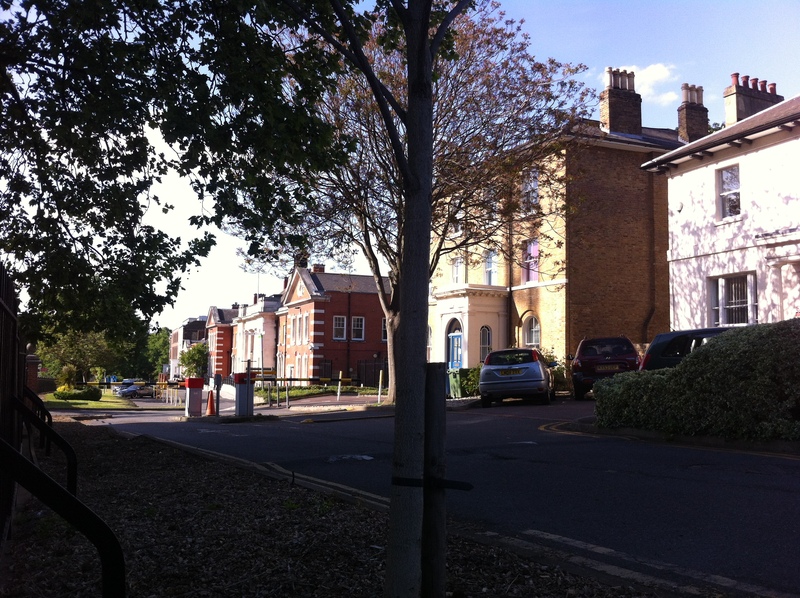 Links between the hospitals and other sites enabled transfer of patient’s requiring long term care from both units, particularly to Cane Hill in Coulsdon and eventually also Warlingham Park, Chelsham. 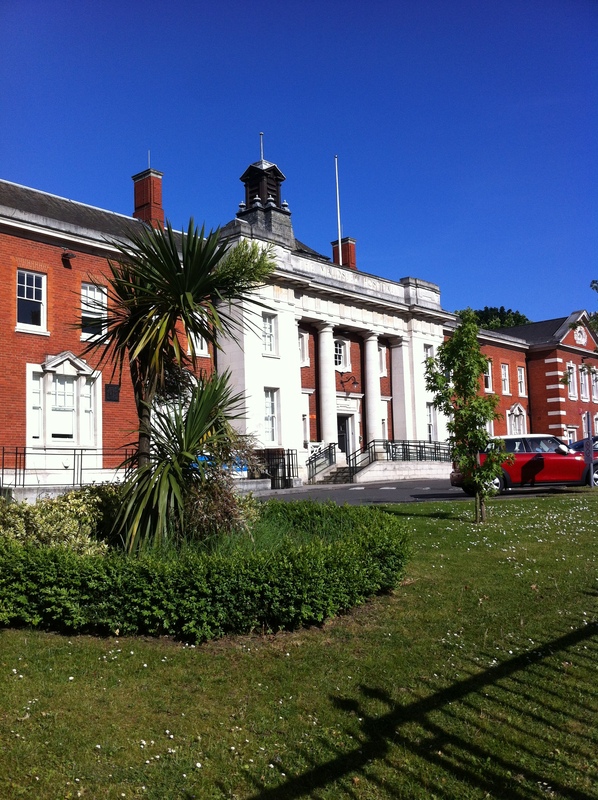 With Bethlem closely linked, Maudsley Hospital took on the role of pioneer in NHS research into psychiatry and psychology and its close links with the IoP and Kings College’s Neurology and Neurosurgical departments and was at the forefront of many new treatments and ideas. 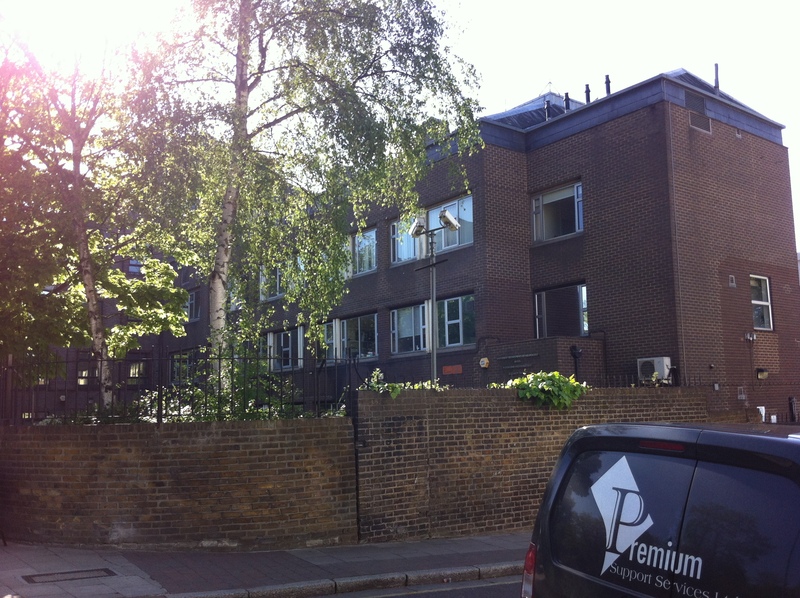 Many of the surrounding properties had been cleared during the 1960’s but new development was slow to follow and most of the remaining buildings were used for offices, peripheral clinical units or staff accommodation. 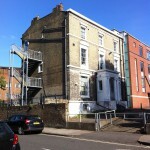 A new office block was constructed in Windsor Walk during the 1970’s which replaced part of a terrace of houses (nos. 12-16) and a former German Lutheran Chapel. 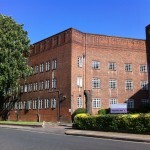 This building eventually became Douglas Bennett House and was converted to accommodate wards with a gymnasium added to the rear.. At the other end of Windsor Walk and facing onto Grove Lane the Southwark Traning Centre was built as a facility for teaching and conferences for staff and patients at the Maudsley and featured an unusual two storey hexagonal block. 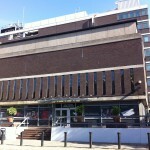 A new building for the London University Department of Neurology and Parkinsons Disease Society followed alongside in the1980s. To the north on De Crespigny Park the IoP Child Psychiatry Unit opened 1984, conveniently located between the Children’s block and the main building of the IoP. Major developments took place on the site in the mid to late 1980’s with the demolition of the westernmost original ward blocks. In it’s place Eileen Skellern House was built and opened in 1991 and to the east, between the remaining ward block and the villa block a similar structure, Aubrey Lewis House, had opened in 1989. 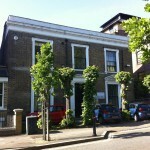 The remaining ward block, middle house, survives to the present day. 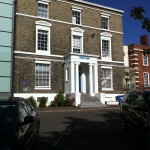 Adjacent to the University Neurology building on Windsor Walk, the National Addictions Centre was opened in 1991 and now forms part of the IoP complex as the Addictions Services building, spread over four storeys. 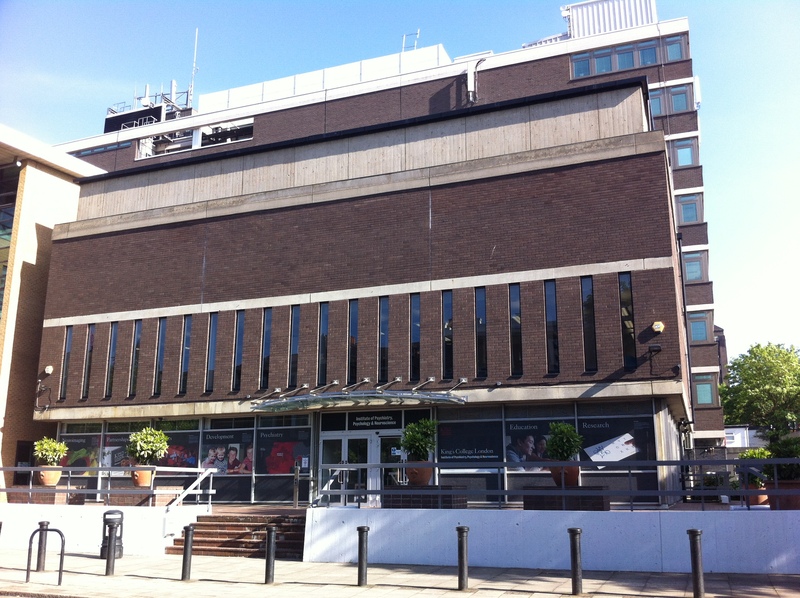 Since the separation of the Institute of Psychiatry and the Maudsley Hospital, the IoP have continued to develop their sections of the campus. 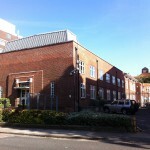 The most recent additions on De Crespigny Park have included the Henry Wellcome (Psychology) and David Goldberg (Health Service Research) Centres built in 2001, the Medical Research Council’s Social, Genetic and Developmental Psychiatry located behind the Southwark Training Centre and the Addictions services building in 2002-3. 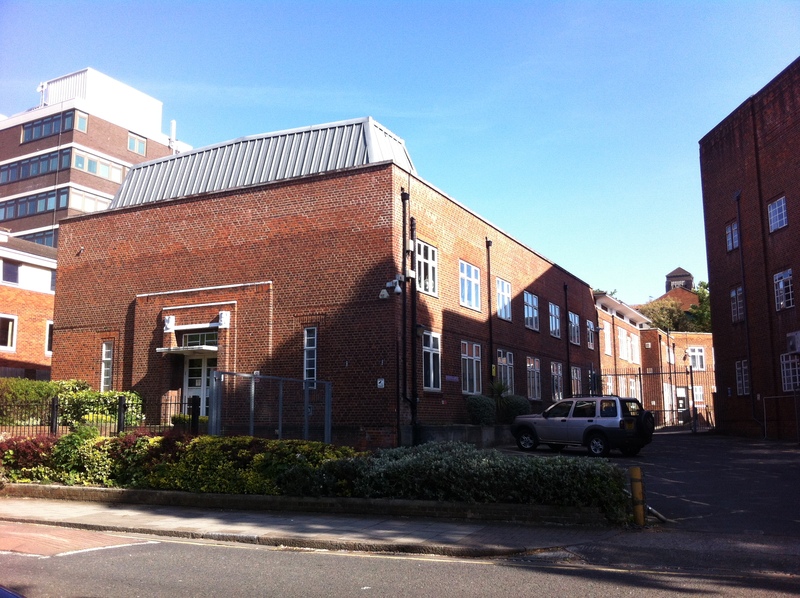 To the front of the site the new Centre for Neuroimaging was opened in 2004 between two surviving houses formerly the site of 101 Denmark Hill. 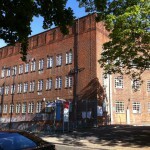 The Southwark Training Centre was demolished in 2011, its space being taken by the new ORTUS learning and events centre in 2013. 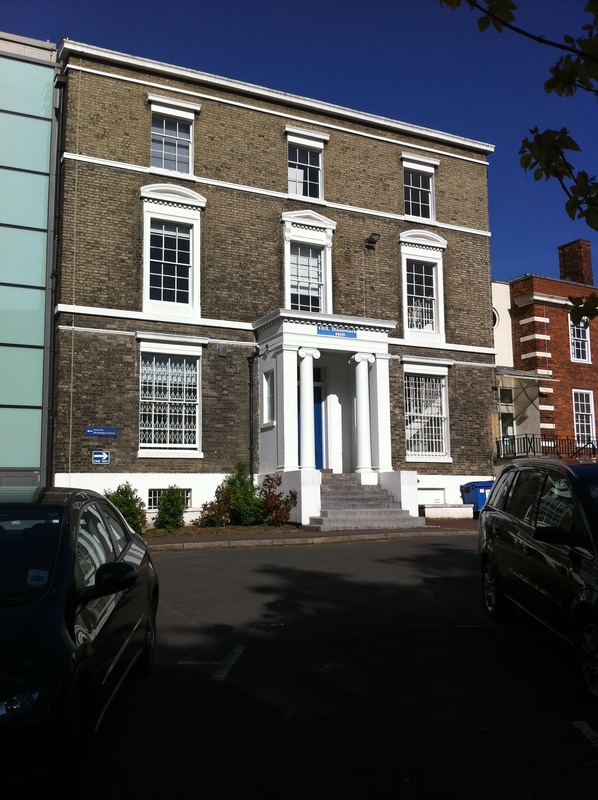 The Institute of Psychiatry also underwent a change of identity in 2014 in order to represent its extended scope when it was renamed the Institute of Psychiatry, Psychology and Neurosciences (IoPPN). 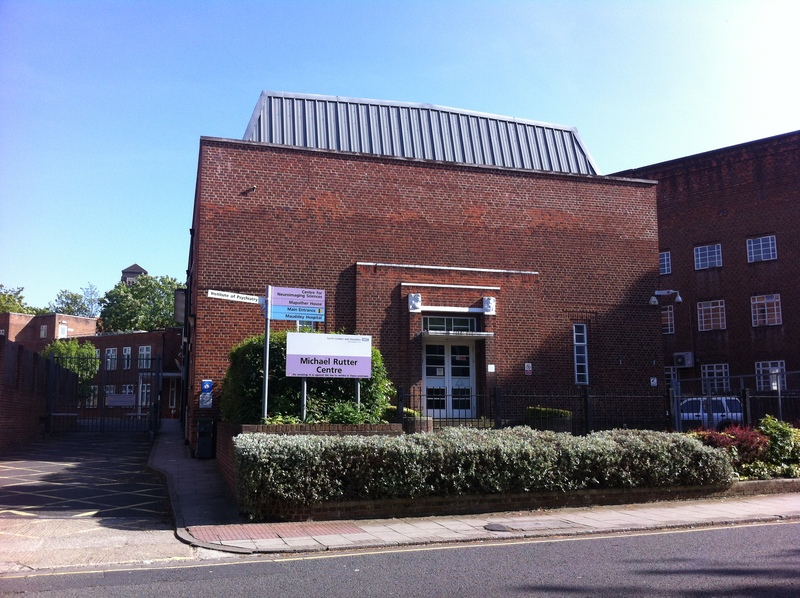 There are no plans to close the hospital and it forms part of the South London and Maudsley NHS Trust of which it has been part of since its creation in 1999. 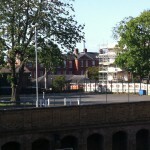 Presently the site retains the majority of its original hospital structures which remain in mental health use. 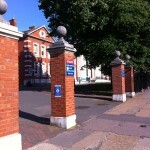 The site remains home to both the Maudsley Hospital and the IoPPN and their buildings are somewhat mixed across the campus. Most of the hospital buildings are however concentrated around the south, west and centre of the site, with the Institutes properties occupying most of the peripheral properties at the eastern boundaries. 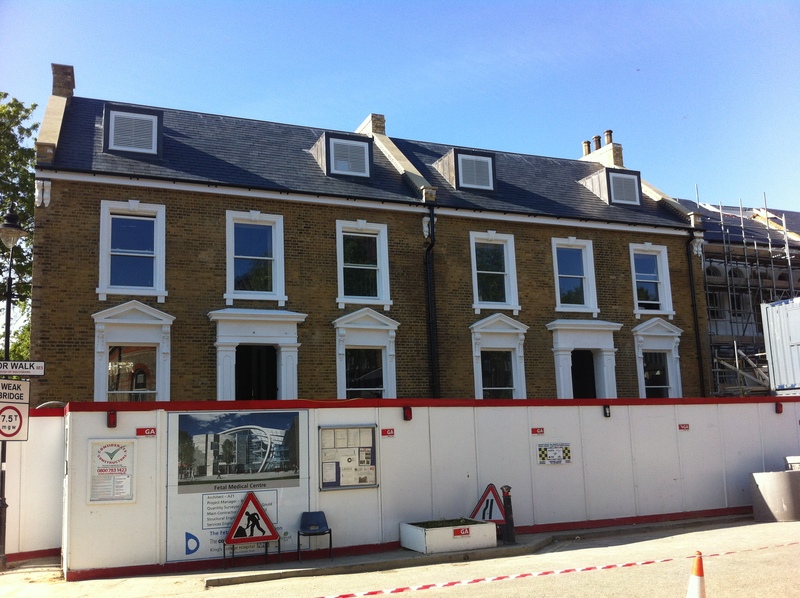 Most of the surviving residential properties around the site are owned by the hospital charity fund and are either in use by the hospital itself of have been renovated for property leasing to generate additional income for the services the site provides.